Summer is a great opportunity to take a closer look at the art around us. With this summer series, entice students to engage with a variety of popular videos from KQED and PBS LearningMedia. These graffiti and street art videos highlight pioneers of Bay Area graffiti, the most popular places to paint, and different styles of graffiti. 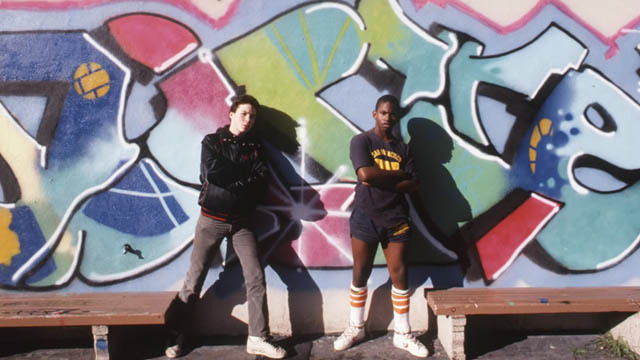 In this video, see rarely-seen photos of San Francisco Bay Area graffiti in the 1980s captured by photographer Jim Prigoff, co-author of the seminal book on early graffiti “Spraycan Art”. Artist Neon describes the styles, spots, and writers that had an early influence on the Bay Area graffiti scene. Do you the difference between a tag and a burner? We asked graffiti artist Neon to describe the five different types of graffiti on the streets. Knowing these terms can help you evaluate, critique, and appreciate these giant, text-based murals. Graffiti artist Edward Martinez adopted the alter-ego “Scape,” as an acronym for “Screaming, Creative, and Positive Energy”. That energy is evident both in his vividly pulsating paintings and in his work with under-served youth in East Palo Alto, California. Adam5100 has been working with a spray can since his days as a teenage graffiti writer living in Albuquerque, New Mexico. Confessing that his early tagging was “the blight of society,” Adam5100 has since become one of the Bay Area’s most talented young painters. The South Bay graffiti artist, David Choe, is celebrated for startling visual intensity crossed with streetwise vision. He paints fast and furious — using aerosol, acrylic and watercolors — able to nimbly capture the slightest emotional serration. His works bridge two worlds and mindsets — the street and the gallery. Discover more local graffiti and street artists featured on KQED, including Scape, Barry McGee (Twist), Margaret Kilgallen (Meta/Matokie Slaughter), Crude and Mike Shine.